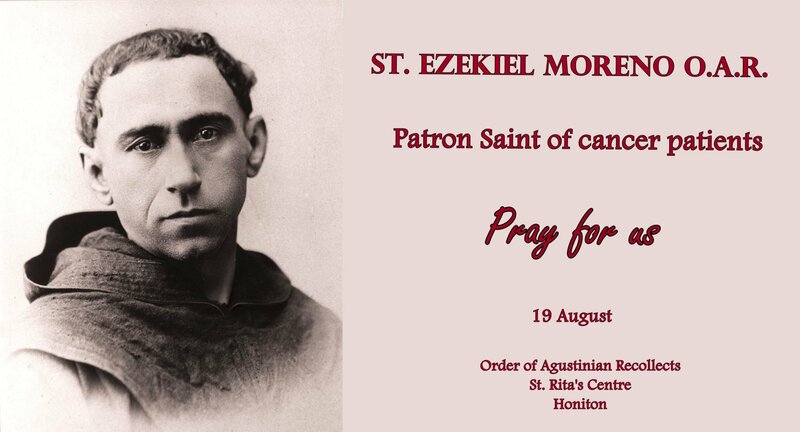 The devotion to St. Ezekiel Moreno is based on the very human concern of believers for their loved ones who are sick, most especially with that most dreaded of all diseases, cancer. In praying for the intercession of St. Ezekiel, one who personally knew the agonies of cancer, we ask God to bring healing and relief to suffering family and friends. Many sufferers have experienced a remission or even a cure of their disease through their prayers for the intercession of St. Ezekiel. Born in Alfaro (La Rioja, Spain) on April 9, 1849, he professed his vows in the Order of Augustinian Recollects in Monteagudo (Navarra) in 1865. He was ordained priest in Manila in 1871 and worked for 15 years in the Philippines. Friar Ezekiel was elected prior of the monastery of Monteagudo in 1885; he left for Colombia in 1888 where he restored the Augustinian Recollect Order and reactivated the old mission. Named Apostolic Vicar of Casanare (1893) and Bishop of Pasto (1896), he was a model pastor for his fidelity to the Church and for his apostolic zeal. He fell ill and in 1906, returned to Spain, where he died of cancer on August 19 of the same year in the monastery of Monteagudo. Innumerable cures, especially of cancer, are attributed to his intercession. Beatified on November 1, 1975, he was canonized on October 11, 1992 in Santo Domingo on the occasion of the V Centenary of the Americas. Loving God, in St. Ezekiel Moreno you have given us a model of courage in times of suffering. I turn to you at this moment of my life for strength. Grant, through the intercession of St. Ezekiel, that I may receive your healing comfort and be restored to health of mind and body, should it be your holy will. I also offer this prayer for those who are suffering from cancer and other life-threatening diseases, through Jesus Christ our Lord. Most loving Father, I humbly ask you to forgive all my sins, to give me a strong will to amend my ways, and perseverance in your friendship. Through the intercession of St. Ezekiel, I beg you to make me grow in your holy service by faithfully fulfilling all my duties. Through Christ our Lord, amen. Prayer of the Day: I beg you, O Lord, for the sanctification of all families, for the Christian formation of youth, and for the specific needs of my own family. Through Christ our Lord. Ask the favour you want to obtain by this Novena. (Pause) Our Father, Hail Mary, Glory Be ... St. Ezekiel, pray for us. DAILY CLOSING PRAYER OF THANKS God our Father, you gave us St. Ezekiel as a faithful preacher of your Gospel and an outstanding pastor of your Church. By his prayers help us reach out to you with all our heart as true witnesses of Christian faith and life. Through Christ our Lord. Amen. Reflection: Love of God and love of neighbour is the synthesis of Christian life.